Four years ago in 2014, the girls and I began a modified hair care regimen. In the midst of that process, I learned that the best way to preserve curls and minimize frizz in naturally curly or wavy hair is to use a 100% cotton tee shirt to dry hair. This is called “plopping,” because you plop your hair into the shirt before wrapping it around your head. For four years with few exceptions, I have dried my hair with a shirt. Yes, that’s important to my story. My hair “plopped.” Trust me when I say, I’m making no statements here, fashion or otherwise! The girls, Mom, and I had a marvelous week away on our cruise. We relaxed, we ate well, we walked – a LOT! We saw ancient Mayan ruins, learned how the Mayans made their chocolate, saw an ancient Mayan soccer (type) goal, and swam and snorkeled in crystal clear, sapphire seas. The second full day of our glorious, week-long cruise, the sun’s beams creeping over the tops of my sunglasses had caused some sore spots on my eyelids. Yes, I had sunburned eyelids. Ouch! My lips were a little chapped, too. I had some chamomile tea in the stateroom fridge for my eyelids (worked brilliantly, by the way! ), and I decided to run up to the beverage station to grab some honey and sugar to whip up a quick lip scrub. That Tuesday – for me, at least – had begun with an hour or so in the weight room before soaking in a hot tub. Then I had to zip back to the stateroom to freshen up before a picture thing with Elsa and Anna, and after lunch, I hung at the pool with my younger daughter and a friend of mine. Now it was time to get ready for dinner. Formal night, so I was taking a bit of extra care with my preparation. I’d taken a shower and spent a little extra time exfoliating and moisturizing. 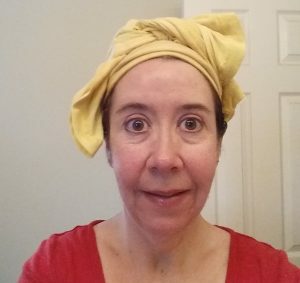 I had gotten out of the shower and wrapped my hair as usual in a chartreuse (we’re talking bright yellowish-green here, folks!) t-shirt. I threw on some clothes, slipped my feet into sandals, and announced that I was heading up to the ninth deck and would be back shortly. Going from Deck 2 to Deck 9, I opted for the elevator. You’d think that any one of four people would have noticed I was getting ready to walk out of the room with a bright chartreuse t-shirt on my head and stopped me. But no. I got into the elevator along with a guy from our deck. He gave me a polite, social smile and a small “hi,” but didn’t say much more than that. About the time he got off on the fifth deck, I realized I still had a shirt on my head! At this point, I had two choices. I could take the shirt off and look like Medusa, or I could keep it on and own the look. I opted for the second, but not without shooting a text to Peter with an “OMG, you won’t believe what I did!” When my elevator arrived at the ninth deck, I got off, sauntered through the adults only pool area, by the family/kiddie pools and went to the drink station where I got my honey and sugar. Then I strutted back to the elevators, owning my unique fashion statement. When I returned to the stateroom, I said, “You’d think one of you would have let me know I had a shirt on my head” before busting out in laughter that quickly infected our room. We’re still laughing about that! Now you hope, when you embarrass yourself in front of complete strangers, that you’ll never have to see them again, and out of a ship of over 2400 people, those odds are pretty decent. But Elevator Guy? I saw him at least twice a day. Of course. It took me a couple of weeks to get through the “transition period” as my hair got used to maintaining its own natural level of sebum. The first week I used conditioner to wash styling product out of my hair (that’s called “co poo,” using conditioner to wash), and my hair felt super greasy. I won’t be doing that again! I read about using aloe vera gel as a styling product and aloe vera juice for detangling spray/leave-in conditioner/light styling gel. I whipped up some aloe vera juice thickened with xanthan gum to use to help hold my curls naturally. It worked! My curls held through some gusty winter winds and a lot of activity. If you’ll remember, my younger daughter started this journey with pretty dry baby hair. Her hair is growing out nicely from her last trim, and it’s so soft and manageable! With it being so dry, it was very tangly, and brushing her hair was a misery for us both because of that. My older daughter has long, thick hair which tangles easily. She complained that the baking soda/apple cider vinegar combo wasn’t getting her tangles out, so it was very difficult to brush. I grabbed my bottle of thickened aloe vera juice, sprayed her hair and set her loose with her brush. She came back ten minutes later exclaiming, “Oh Momma! This stuff is a miracle! Look at my hair!” Her hair was smooth and shiny with no tangles; she said the spray had gotten all the tangles out. I also made up a batch of beer conditioner for her hair to help give it a little extra moisture. After a couple of weeks of going no poo, I was distressed to notice flakes in my hair. LOTS of flakes! Ew yuck! And my scalp was beginning to itch, too. Oh dear. We simply cannot have that! In addition to that, my older daughter had flakes along her part. Back to the Facebook No Poo group and a whole bunch of handy links to determine how to take care of flakes when you’re no poo’ing. Ah-ha! Our old trusty aloe vera comes through again. A mixture of aloe vera gel and honey (2 parts aloe vera gel to 1 part honey) really hydrates the scalp. So I whipped up some really quickly and ahhh!!! My scalp felt heavenly again. Over against all this, I have to admit that I just can’t let go of my styling mousse and hairspray, and I’d just bought a brand-spankin’ new can of hairspray before going no poo. I was prepared to use some of my artisan made liquid soap to wash the product out of my hair. After all, while soap isn’t ideal for daily use without a vinegar rinse weekly, it should be OK once in a while, right? So, imagine my excitement to discover that the aloe vera and honey combo breaks down all that styling gunk while it hydrates. Score!!! I get to use my products and have clean hair without having to use soap. Triple win!!! I’d learned in the FB group I’m in that you can use any acid (within reason) for the rinse, not just vinegar. Coffee and tea are both acids. I didn’t know that. I really wanted to try a coffee rinse with some leftover coffee… Wait. “Leftover coffee”? What’s that? Most of my friends, colleagues and family have no concept of “leftover coffee”; they drink every last drop. Anyway, I discovered about 4 ounces of leftover coffee, so it went up to the shower with me on Tuesday. Best. Rinse. Ever! I did smell a little bit like coffee, but no one here minded. I’ve learned what “plopping” is. When my mom and I go on our next trip together, she’s going to be looking at me sooo strangely! This is my hair after a month of no poo. That is NOT a silver streak in the back; it’s where the sun came in. Just had to clarify that. My hair has grown faster than usual. I commented to my husband that my hair was curlier and softer than it’d been, and I mentioned the aloe/honey mixture. He said, “No wonder your hair’s been looking happier lately.” I have happy hair! Woohoo! My hair is curlier than it usually is this time of year. It’s generally fairly straight during the dry winter months. After my last trim, my hair was lank and straight, much like my Grandma’s had been, which was not the look I wanted, especially not at this age. Now it has new bounce and body. Of course, I use artisan soap every time I bathe, and this time of year, I expect my skin to be a little drier because of it. (Real soap contains glycerin, which draws moisture to itself. When it’s humid, it draws it from the air; when it’s dry, it takes it from my skin.) The sulfates which are in commercial shampoos dry hair out. I’ve noticed that, as I’ve gone without those sulfates in my hair care regimen, my skin isn’t nearly as dry as it usually is. That makes me wonder if the shampoo was drying my skin as I rinsed? My hair has so much bounce and body that it’s been looking cute and styled even when I don’t do anything with it. Another win! It’s times like this, I think I’m a hippy in the making, but I absolutely refuse to give up my razors! Does going No Poo sound like something you’d dare to try? Going No ‘Poo: Yea Or Nay?